A grand strategy board game that allows players to immerse themselves in the world created by J.R.R. Tolkien. The holder of the crown for most stunning Tolkien-themed game—and one of my favourite games of all time—is the classic, War of the Ring. If you enjoy a challenging, moderately complex wargame absolutely dripping with Lord of the Rings theme, this game is a must-buy. What an incredible game this is—no other game I’ve played so effectively captures both the epic feel of armies clashing in Middle-Earth, and the desperate journey of the Ring towards Mordor. Everything about this game is big—the huge board, the roughly 200 plastic figures, over 100 cards—not to mention the huge scope of the game. 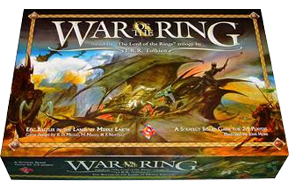 Not only does War of the Ring cover sweeping, epic armies battling over Middle-Earth, but at the same time it tracks Frodo and Sam’s journey to Mordor, and somehow manages to balance these two very different game mechanics into a harmonious whole. One of the innovative ways this is done is through the use of custom dice that display icons instead of numbers. The players roll these dice and can move, attack and trigger events according to the various icons that come up. It’s an indication of the popularity and classic nature of War of the Ring that a Collector’s Edition was produced; truly a gamer’s dream and my most treasured gaming possession. Not only are all the figures in the game hand-painted and resting in faux-velvet-lined compartments, but the redesigned board is 25% larger, the rulebook is gold embossed, and the game comes in a huge painted wood and resin box decorated in suitably Elvish fashion. It certainly doesn’t come cheap, but it’s probably one of the greatest expressions of the boardgame art form available! Set aside a long afternoon and immerse yourself in War of the Ring. The original War of the Ring expansion Battles of the Third Age was an interesting supplement that not only expanded the original edition, but added two more ‘mini-games’ that focussed on the battles of Isengard and Minas Tirith, using modified mechanics. The first edition v2.2 summary and reference includes the additional rules from this supplement. v5 of this summary is completely reworked for Second Edition, and includes the rules from the expansions Lords of Middle-earth and Warriors of Middle-earth. I’m eagerly awaiting your second edition rules summary. This 1E summary is amazing…. Thanks! I’m working on it – it’s a bit more complex than I expected! I was lucky enough to get my hands on a WotR CE and played the game last weekend for the first time. It took us 8 hours and was a blast! The UH rules summary was an invaluable companion getting the game started. Thanks UH! I do love your player aids, thank you for all the spared hours flipping through rulebooks. When the Fellowship is revealed by a Reveal icon on a Hunt tile and the FP traces its movement from its last revealed position, the Fellowship marker can’t end up in a FP stronghold or FP-controlled city or stronghold. I don’t quite understand your confusion… Remember they’re just reference sheets, the full description is on page 3: ‘The Fellowship and Mount Doom’. Thanks a lot for this rules summary. There’s everything needed during the game!! Just above excellent. “Turn the Progress counter to its hidden side by using a Character action die or by playing an appropriate Event card. I think the last sentence is wrong, as the Fellowship cannot move due to the use of the same Character action that hid them, but they can move later in the same turn if another Character action die is used. Maybe the sentence should read “The Fellowship cannot move in the same action”. You’re absolutely correct, I’ll fix that immediately. A tiny little thing could be clearer. Since by the release of the first expansion they had decided that all characters may be recruited inside Strongholds under siege, some of the card difference may cause some confusion (including, e.g., the difference between the two versions of the Mouth of Sauron). For that reason (and that indeed did cause confusion in one of our games), I suggest simply deleting from Saruman’s Enter Condition and the Mouth of Sauron’s Place on “even if under siege”. In the “Characters” part of the main text, this could be further clarified by expanding the “Minions are brought into play using a Muster die (using the rules on the appropriate Character card).” to include this notion. However, it should also be noted that this includes the two FP characters (the Elven lords, who can be placed in Lorien and Rivendell even if they’re under siege). Thanks for the tip, I’ll have a think about this. In that game I mentioned, it was quite a chaotic confusion. I wanted to recruit the Witch-king in Dol Guldur, but my opponent would not allow it since it states nowhere that he can be recruited “even if under siege”. Then, he was not sure if he could recruit Galadriel in Lorien which was under my siege, since nothing was written as to whether she could be recruited in a Stronghold under siege – neither in the rulebook, nor on her Character Card. Going for the FAQ did not help,since there was no info there regarding recruiting characters under siege. That subject has always been a tricky one in WotR. It was a mess in 1st edition. I’ll try to clarify it better in the summary. Did you consider clarifying the whole “recruitment under siege” thingy? Sorry, I forgot, I’ll make a note and get into it when Xmas madness has passed! I’m not specifically ignoring you, this just happens to be one of those vanishingly rare times when a specific request has been forgotten. A more considerate reminder would be appreciated, considering all this work is being done for your use for free. I will definitely address this issue in the next update, coming next week. BTW the Balrog can be recruited in Moria if it is under siege. You just don’t get to put a Sauron unit there as well if it is. I truly have no intention to be inconsiderate. I sincerely apologize if that’s how you’ve interpreted my attempt at comedy. I have played dozens of games of WoTR, and I rely upon your guide to get me back up to speed between plays! Have you given any thought to a Warriors of ME update? Excellent. That will come in most helpful. How is it going with the new version? Is it safe to print current one? I’m wondering if current pages will change or Warriors will just get a separate page like the Lords expansion. A bit longer I’m sorry – we’ve just moved house and I’m a bit busy. It will be on a separate page, but I can’t completely guarantee there won’t be little changes to other pages. Brilliant work – thank you! Are you still working on the Warriors of ME update? Yep, sorry it’s taking so long! Next time I get a chance I will! Getting good enough at this game that we can just about play with only the half sheet summaries in front of us. So helpful! On page 6, reference sheet 2, front, under SP Leaders (Nazgul), second paragraph, second sentence: “Alone they may only enter a region containing a FP-controlled stronghold unless it is being besieged by a SP army.” Should either read “Alone they may not enter a region containing a FP-controlled stronghold unless it is being besieged by a SP army.” or “Alone they may only enter a region containing a FP-controlled stronghold if it is being besieged by a SP army.” Both work, but I prefer the former. What! Typos in my lovely sheets! Outrageous! They will be fixed asap, thanks for the heads up King. UH… you will probably be outdated to know that War of the Ring is 81 in Tabletop Gaming magazine top 150 games. Best sellers as opposed to best games. Can’t you edit? I thought you could if you were logged in. Anyway, glad to see WoTR is up there! Forums I can edit. Comments I can’t. The site and the guide is fantastic. I’m the process of printing several out on cardstock at the local office supply store and will happily contribute to the site as a thanks. One question on this particular doc – it’s not entirely clear on the printing instructions. It seems like some pages are meant to be printed single-sided, while others are meant to be double sided? Yes that’s true – but hold off printing for a bit because because I’m about to release an update. Should be out in the next few days. Thanks again very much. I’ve added several card stock printouts to my collection. They are a huge, huge help. I’ll get to make my maiden voyage with WotR on Monday, think the update will sneak in ahead of that or should I just go ahead and have 5.1 printed? So sorry for the delay Ryan, I’ve been flat out. I’ll get the update finished this weekend at the latest! You’re the man!! Thank you.